My current project is working on the ISS-Above and setting up a display for my 7 year old daughters elementary school. Currently I am in the planning stages still need to get with the Principal and IT Department but it should be an easy sale. The International Space Station passes overhead most of the populated areas of the world more frequently than you would imagine. If only you knew it was there. That’s what the ISS-Above does. It lights up when the ISS is nearby, but that’s not all. It can also TWEET a message to the Space Station and it has its own built-in web server to give you a ton of information about current and future passes. It’s both an awareness thing, so more people get to know the Space Station is in their sky, and it’s also to let those who are “up there” know that we know and appreciate what they are doing! This video will show you how they work and what they look like when the Space Station is making an overflight. I am planning on using the PiLite to scroll the messages and have the kids do all the artwork for the display, research the ISS and so on. I actually just got the beta installed and was lucky enough to have the ISS passing overhead at just the right distance to tweet for me Here is the dated message. I need to clean up the post inside the config file which is easy enough. This is just an example of some of the things I do with the Raspberry Pi. I always include my kids. Emma age 7, Isaac age 13, and Jordan age 15. I donate a lot of Raspberry Pi's to their friends and friends of their friends. If they can't afford to get one themselves. I do this to encourage them to learn more of how computers work. And have common interests between them. This is one reason I entered the contest as it gets costly and the interest of kids and they're talent is abundant. 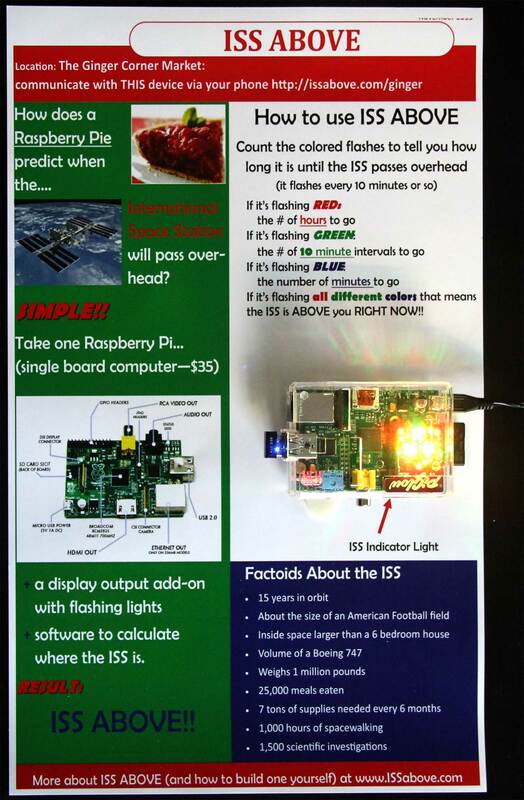 I encourage you to come up with creative ways to get a Pi displayed somewhere. I don't recommend just giving them away but it's fun to see your Pi on display doing something cool. Sign a contract and get it back after a week or so. Who knows maybe you could start an advertising business. I want to integrate this web page into it so it has even more information and to be a bit more interactive. I'll need to get permissions to have the webserver running in the school maybe setup a private network or something. Anyone with a phone, tablet, laptop, or pc connected to the network could launch the webpage and see what is going on in detail. Overall I think it's a fun idea and to include my daughter and her entire class is fantastic. A pic of all of them would be included since they're in first grade I'll have them listed as the donors of this unit so they can have some clout in school. This was my inspiration for the idea the first publicly displayed unit. Well let me know what you think or if you want to maybe setup one as your own project at home work whatever. Nice, I have been to the ISS above site. Very cool. Total: $130 (OUCH) But worth it for my kids. My plans are to just donate it for a period of time. But I am assuming once they see it they'll try to have me give it as part of the deal. I'm prepared either way.